It seems that kale has been all the rage lately. Both on TV and Pinterest, I am constantly seeing people making their version of kale chips and simply discussing how great the stuff is. I am embarrassed to admit that as a vegetarian, I've never tried it. Until now. I was at work yesterday, and when a conversation steered in the direction of kale, I realized I'd waited long enough. Thanks to watching an episode of The Engine 2 Diet, I knew exactly how I'd try it first. I won't lie; I'm not in love with the stuff. I don't hate it either. I will have to let kale grow on me and keep playing around to see how I like it best. Regardless, I'm thinking if you are already a kale lover, you'll enjoy this! Rinse kale leaves and tear into bite size pieces. Add 1/2 avocado and juice of 1/2 lemon. Mash and mix all three ingredients together. EAT! Kale lovers, help me out - what is your favorite way to enjoy this stuff? Thanks to Coastal Charm, Clarks Condensed, Jam Hands, Hun...What's for Dinner?, & This Chick Cooks for featuring this post! its a little better cooked down in my opinion, but still good. we had it with dinner last night. Cut out the rib, chop into small pieces, saute in a pan with a little garlic and oil until it wilts and you get a little caramelization in the pan. put in a pinch of salt and a few grinds of pepper, splash in a little white wine and cover to steam it up. Take the cover off and just cook over low/medium heat until the liquid is gone. the greens with be a very bright and deep green color. They are quite good this way. Hey Bekah! This recipe looks de-lish! Not sure if I told you, but I'm following you thru Bloglovin'! 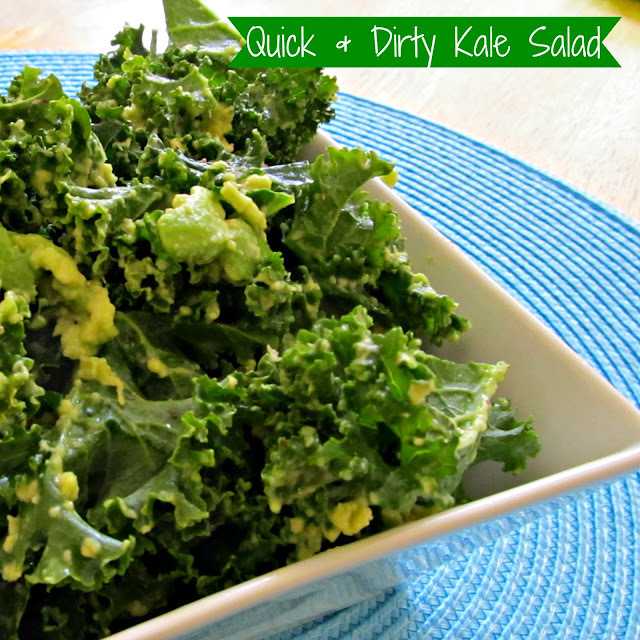 Always looking for a wonderful way to prepare kale since it's so good for you!! Thank you so much for linking up with past Aloha Friday Blog Hops!! I'm just now getting around to following everyone back. I've followed you via GFC & Bloglovin. If you have time, I hope you follow me back if you haven't already!! The new Aloha Friday Blog Hop launches Thursday evening and we are hosting a GREAT giveaway!!! Come and check it out tomorrow! Aloha Friday Blog Hop HERE! I love the name of this recipe!! Sounds great! I've only had kale in soups, so this salad really intrigues me. Plus it's paired with avocado, so that's always a winner in my book. Thank you for sharing with Simple Supper Tuesday! Hi! Last summer, I had just gotten into green smoothies and I was really enjoying kale in my smoothies. One day, I was out of my green leaf lettuce that I used for my salad. It was raining and I did not feel like going to the grocery store just to pick up some lettuce. Well, I had heard and read about all of the great benefits of kale for salads and reluctantly decided to give it a try. (Now, I wasn't looking forward to this because the only way that I had eaten greens before was if they were cooked.) So, I washed some kale and broke it into bite-sized pieces. Then, I poured a small amount of olive oil over the kale and sprinkled it with sea salt. I massaged the kale with the olive oil and salt, covered it and allowed it to marinate for about fifteen minutes while I chopped the rest of the fruit and vegetables for my salad. After I prepared the other fruit and veggies, I made a salad - replaced the lettuce with the kale. I topped it with my usual ranch dressing. I was amazed. It was so delicious that the next time, I decided not to use the ranch. Now, if I'm at home and I have kale, I make my salads with kale instead of lettuce. I have also used kale in soups before. I recently shared a kale salad on my Meatless Monday post.